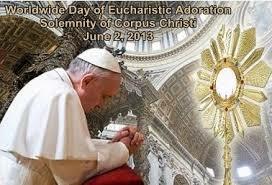 This Sunday is the Solemnity of the Most Holy Body and Blood of Christ, also known as Corpus Christi. For Catholics, the Eucharist is the focal point of our Liturgy and our prayer life so today is a very special day as we celebrate the Unity of the Church and all of humanity. Today’s reflection is from a homily given in 2012 by Fr. Frank Schuster, Pastor of Blessed Teresa of Calcutta Parish in Woodinville, Washington. There is only one Mass celebrated throughout the world throughout space and time. When we receive the Body and Blood of Christ, and if Mom is correct when she says, we are what we eat, when we leave the church after Mass, we should become Christ to the world. We are to be Eucharistic ambassadors, participating in what Jesuit theologian Teilhard de Chardin called the Transubstantiation of the World. Transubstantiation is the word we use to describe how the bread and wine become the body and blood of Christ without destroying the appearance of bread and wine in the process. When Teilhard refers to the transubstantiation of the world, he speaks of the transformation of the entire world into the body of Christ if we live out our Eucharistic calling. I want to conclude this homily with a paraphrased excerpt and prayer from Teilhard de Chardin’s work entitled The Divine Milieu. Theilhard writes, “When the priest says the words hoc est Corpus meum, [this is my body], his words fall directly on to the bread and directly transforms it into the individual reality of Christ. But the great sacramental operation does not cease at that local and momentary event…[Indeed], a single event has been developing in the world: the incarnation, realized, in each individual, through the Eucharist. All the communions of a life-time are one communion. All the communions of all human beings now living are one communion. This entry was posted in Sunday Reflections and tagged corpus christi, teilhard de chardin, transubstantiation. Bookmark the permalink. Thank you for sharing this homily. Mass has never been the same for me since I read a portion of the Mass on the Altar of the World by Teilhard de Chardin. 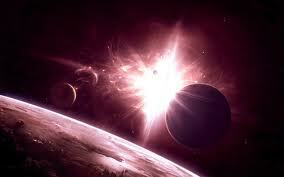 It has become cosmic in its nature and scope. Teilhard writes so powerfully and passionately: “It is a fire that sweeps over the hearth…[the Eucharist] consumes me.” I have just ordered “The Divine Milieu” and I hope I’m able to understand it for Teilhard was so brilliant and his writing can be very academic. Lynda: Thank you for sharing. My reading of Teilhard’s “Mass on the World” was a life changing event for me also. I first read it a few years ago when I was in my transition from the agnostic phase back to my new Catholic phase of my life. As you said, it was so powerful in its cosmic scope that it was the bridge I needed to synthesize the intellectual issues with Christianity and my “gut” feelings about Christianity. Pope Emeritus Benedict echos this theme in this book “The Spirit of the Liturgy”. http://wp.me/p3pJsV-6S. Regarding Mass on the World, I highly recommend the book “Teilhard’s Mass” written by Thomas M. King, SJ. http://tinyurl.com/m2czbt2. This book is a masterpiece at analyzing Mass on the World. It also includes a sample prayer service based on Mass of the World. I would love to participate in this service in my lifetime, ideally as part of an Easter sunrise Mass. I hope you enjoy “The Divine Milieu”. Honestly, I thoroughly enjoyed it, but also found it a tough read, largely because of Teilhard’s terminology and translation issues. It is a great read though for its ideas. I found it useful to also read Louis Savary’s “The Divine Milieu Explained”. http://tinyurl.com/mubc8dx. I found this useful to both translate and analyze “The Divine Milieu”. I have heard that “The Divine Milieu” is a tough read – my spiritual director and professor told me this – however, I am irresistibly drawn to read more. Thanks for the book suggestions. I will be accessing them from the university library as I must control the number of books I purchase! !